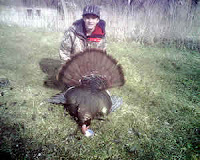 The turkey season started over the weekend with the Wisconsin youth season Saturday and Sunday. I took my son Andy over to a farm we hunted for the first time. I met someone through a work assignment who lives in the zone where Andy had a tag to hunt and she said her neighbor has lots of turkeys, so I called him and got permission to hunt. Boy, she was right. This property was loaded with birds! Even though the weather had been especially nasty last Thursday, Friday and Saturday, we went out late Saturday afternoon to set up the blind and do some calling to see if there were birds in the area. I heard a gobble in the distance, then called and he came closer and gobbled again. It was getting late, so I decided to leave him alone and come back the next morning and try for him. With sunrise at 6:30 and legal shooting hours at 6, we got back to the blind at 5:30. It was still plenty dark, but we heard a gobble before we even got into the blind. Then, just minutes after we got in, the birds went absolutely nuts! I’ve never heard so much gobbling in my life and it kept on going after the birds flew down from their roosts. There were at least 10 or 12 birds gobbling around us and they were gobbling so often I couldn’t even tell if they were gobbling to my calls. They gobbled to just about every sound they heard. There were several birds that were working their way toward us, but we had to wait a while until one finally showed. He gobbled just up the hill from us, so I was confident he would come all the way in. I had Andy position himself facing where the bird gobbled from and we just waited. About 10 minutes later, I looked down the picked corn field to the left and there he was in full strut. He put on quit a show as he strutted all the way in. The decoys were to our right and he was to our left, so the setup was perfect. He worked his way from left to right and crossed Andy’s line of fire. At 20 yards, I did a call to get him to lift his head and Andy made a great shot. It was an awesome hunt and an awesome bird. The beard was 9 1/2 inches and he had a spur length of just under an inch with a nice point at the end — probably a three-year-old bird. His other spur was broken off, so he obviously was doing some fighting. Tomorrow, I take Andy and his brother Joe on their Minnesota hunt, then I go in Minnesota next week, with a Wisconsin hunt ahead in mid May. The only thing that went wrong on this hunt was I forgot my camera. So, I had to take this picture with my cell phone. It felt funny being a professional photographer and relying on a cell phone to take an important picture. I’ll try not to let that happen again!